One idea, of course, is to buy a portable DVD player, a stack full of DVDs and just press play as you pull out of the driveway. We do enjoy a good movie like the next person, but movies do not keep the attention of all of the kids. So, perhaps an idea would be to keep this for a “I think we might all go insane; I just need a little peace and quiet” moment. We also like to keep a lot of books on cd (or ipad/ipod)– Magic Tree House, A to Z Mysteries, and Junie B. Jones are some of our current favorites. Give the kids a map so that they can follow along. This certainly will not stop the “Are we there yet? !” question, but it will help them to gauge how far they’ve come, and how far is yet to go. You can either use Google Maps to print the map or go visit iheartfamilytravels.com for a cute printable map. For a one day trip, it can be fun to buy some small items to put into paper bags that the kids can open every 30-60 minutes. We did this once when we were traveling with 3 kids and it worked out really well. I bought items from the Dollar Store, and the $1 spots at Target, Michaels, Joanns, etc. so it ended up being pretty inexpensive. Unfortunately, once you do this once, it’s hard to do it again because there are only so many items that you can buy for $1 that are actually going to be fun. Once you buy them all the first time, there’s very few fun new things to get the second time around. In the paper bags, you can also put fun snacks (a box of juice, a pack of fruit snacks, etc.). Yes, you would be giving them those things anyway, but if they come in a paper bag, it’s just that much more fun to eat them! We like this one not because it makes the kids “smarter” (because it doesn’t), but because it’s a fun way to get all ages interacting. We were playing with one at the library the other day, and everyone wanted to join in answering. The questions also served as good conversation starters. As for the purchasing, it certainly helps to start shopping early– many of the items I got for a dollar or two (on sale, dollar spots, off craigslist, kid consignment sales). I shop year-round…meaning if I find something that looks like it will be travel-worthy, I pick it up. Also, if it’s just a vacation trip, it might be smart to borrow from a friend! I have a friend who lets her kids eat what they want in the car. There’s no “wait until snacktime” — anytime is snack time. She says that while normally she’s vigilant about eating healthy and moderately, one day isn’t going to hurt them. Of course she provides many healthy options, but throws in a few “sometimes” foods as well. 5. Before you leave, do a travel busy bag swap. For some ideas, see a post we did last year. You can also visit my Pinterest board for more ideas. Get out, run around. Pack a ball and glove for a quick game of catch while others are using the restroom. Have some quarters handy to grab something fun from the vending machine. And don’t forget a portable toilet seat for those kids who can’t go on a big potty (that would be one of mine). Tempted to even keep our training potty (along with some clorox bleach wipes) in the trunk so that we can whip it out quickly (think: side of the road when no bathrooms for miles but 2 year olds can’t really hold it). Putting a disposable diaper in the bottom of the potty can soak up the pee until you get to a place to clean it up. 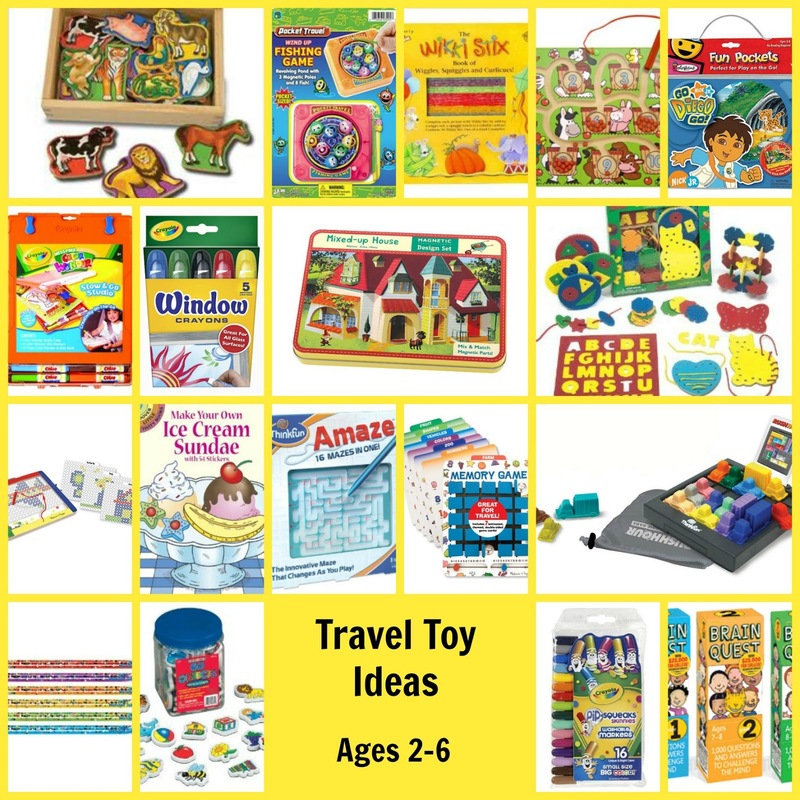 If you think these ideas are great, check out MaryAnn’s post on tips for planning an awesome family vacation and my post full even more great ideas about traveling with kids. How about you, what are some of your tried and true traveling hints? For me, the secret to traveling with my little girl is to always pack an extra pair of leggings in my carry on. That way if she spills something on her pants, or gets cold, it's easy for her to slip them on. Plus, they pack really small! My daughter's favorite brand is http://www.twirlygirlshop.com/girls-capri-leggings but obviously there are lots of places to get them.